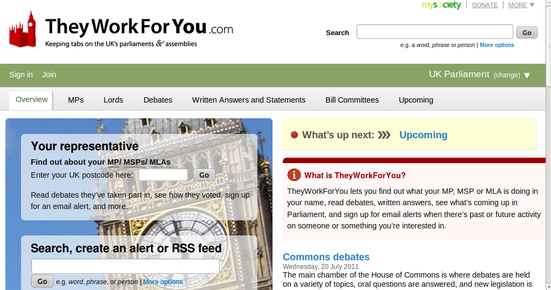 TheyWorkForYou is a website that connects citizens with Members of Parliament in the UK. Following a scandal in 2009 when the government sought to have MPs’ expenses claims kept secret, MySociety mobilised voters to send a few thousand individualised emails to MPs demanding transparency in the use of public funds. Soon after this campaign, the UK government agreed to disclose data on MP expenses.